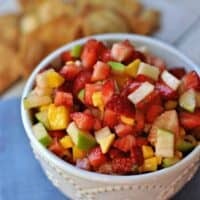 Delicious, easy to make, picnic perfect FRUIT SALSA! 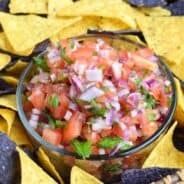 Having spent the weekend camping, I’m reminded how easy and delicious this salsa is to bring…anywhere! The first time I had this was last year, camping with my brothers and their families. Having 3 brothers and no sisters I am very lucky to have 3 great sister-in-laws! They are each a blessing to our family, and each one is a blessing to my brothers! This recipe comes from Casey, the youngest of the troop. She brought this to our camping trip last year, and we all gobbled it up. Of course she shared the recipe, which I have then used to make several times. Usually, I tend to change things, add/subtract. You know. Enhance. This recipe is perfect as is. No need to change a thing. Even the choice of fruit in this recipe pairs to nicely with the seasonings. And I’m not a big fan of mango. Unless it’s a margarita. But, then again, I’ll drink any flavor margarita. As we are leaving for another camping trip this weekend, I had to make more of this salsa. I hope you enjoy it as much as we do! Thanks Casey! Easy, fruit salad recipe with a hint of ginger, mint and orange! Dice all fruit VERY VERY tiny. Stir in seasonings and serve with cinnamon pita chips! 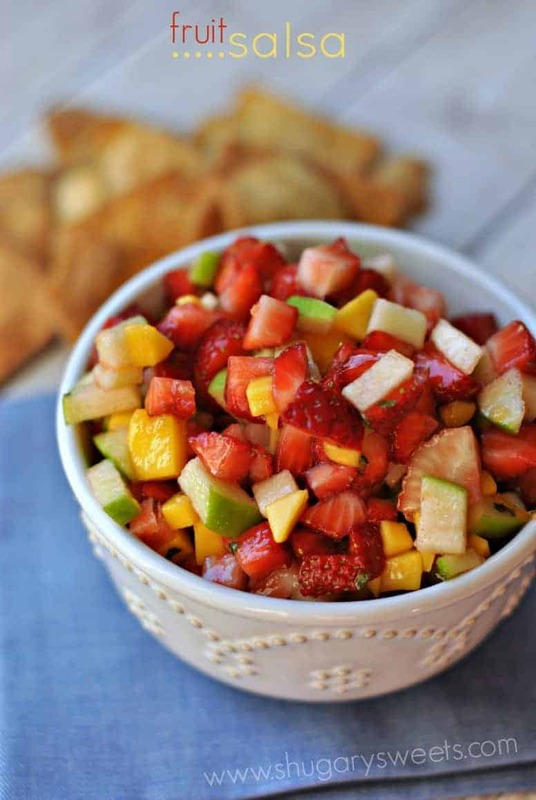 I do love fruit salsa, this looks very yummy! I have 5 brothers, no sisters but I do have 5 great sister-in-laws! This looks so refreshing and delicious–perfect timing for the season…Thanks! Looks and sound like a very delicious fruit salsa! I would love to try it soon. Lucky you got to go camping! I miss camping a lot! Sure it is a great dish to bring to the camp site. Love those vibrant colors from the fruit and mint. Thank you for sharing. BTW, I’m hosting 2 Giveaways on my blog. One for $50 Thrive Products and the other is Baking molds and more. 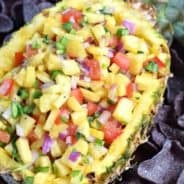 Please stop by to enter if you’re interested. Thanks. @Cindy- you too are very blessed then! @Amy- we love camping. I’ll check out your blog today! @Holly- thanks, it’s perfect too because strawberries are in season right now! Katie= I beat you to it! This looks great! I’m always on the lookout for fresh summer recipes. I think this is a keeper. 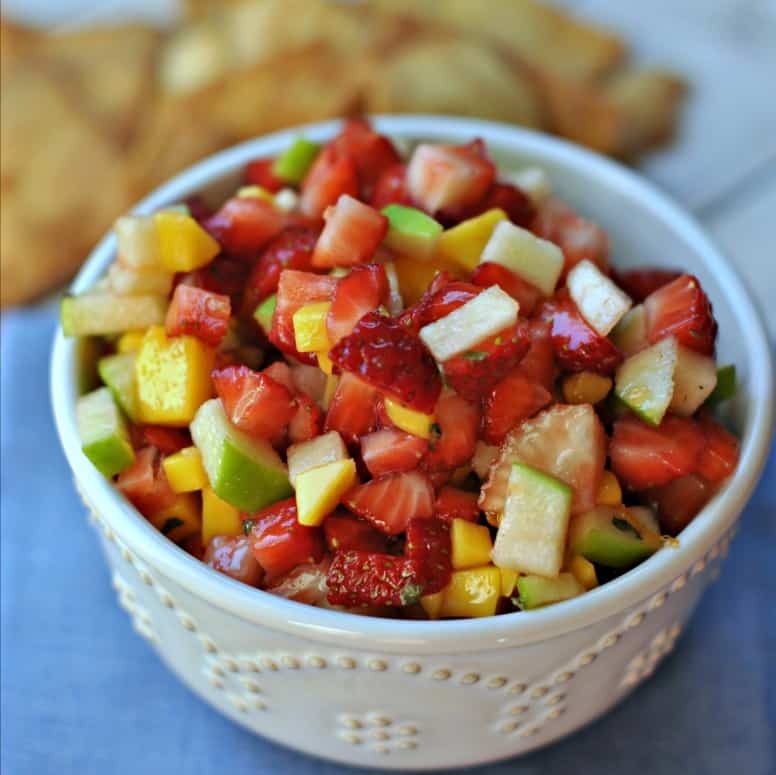 Fruit salsa – one of our favorite summertime treats. I use a combo of strawberries, crushed raspberries, pineapple, kiwi, mango or papaya, peaches, and apple (for crunch) and a bit of sugar to draw out the juices – as you can see, a little more labor intensive, as all fruits should be finely chopped (preferably by hand). For chips, I spray flour tortillas w/veg. spray, sprinkle with cinnamon sugar (only necessary on one side), cut into triangles, spread on a cookie sheet and bake @ 350 for 5-10 min (watch after 5 minutes, so they don’t burn). Light, fresh, simple…and simply wonderful! Can’t wait to try this one! 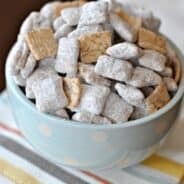 This would be so good with some cinnamon chips and it’s so healthy to boot. Thanks so much for sharing this at Sweets for a Saturday. Thank you so much for submitting this to my monthly recipe collection for July – Cookout Food. Thanks for sharing your thoughts on vinyl collectible dolls.